The PBN AIMA3000 RRAF series Analog Return Receiver - FSK are designed for multi-services operators to increase network-return capacities for the ever-growing demand for data and voice bandwidth, while minimizing physical headend space and power requirements. The RRAF, as a key element of the AIMA3000 platform, is designed to plug into PBN’s latest generation Advanced Intelligent Multi-Service Headend Platform (AIMA3000). The RRAF incorporates four independent optical return-path receivers that can operate at any wavelength between 1260~1620 nm. This density allows up to 64 independent receivers in only 4 RU of space. The user can set each receiver individually for operation in either manual gain control (MGC) mode or automatic gain control (AGC) mode. The unit has a low-noise profile and high-performance amplifiers to ensure a good signal-to-noise ratio as well as low distortion characteristics. The RRAF is compatible with PBN’s existing optical nodes including the ODN1P, ODN2P, ODN4P, and ODN2000. 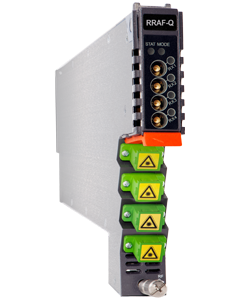 With high RF outputs, the RRAF can be adapted to work with various headend configurations. Microprocessor-based status monitoring and control requires an AIMA3000 System Management Module (ASMM) in slot 0 of the chassis. All module settings are retained in non-volatile memory to ensure trouble-free operation. Furthermore, bulk updating, automatic uploading and downloading of configuration files and PBN’s NMSE Web-based Management system are available for this module. In addition, RRAF makes use of FSK to allow for remote node monitoring. (1) Standard option. Contact a PBN Sales Representative for availability of other options. (2) Measured in a typical system with -6 dBm optical input, 6% OMI, gain setting adjusted to maximum (the stated RF output level does not necessarily apply with other optical input levels). dBuV= 60+dBmV. (4) RRAF: Measured in a typical system with PBN ODN4P-RT, 4 channels, (11.5 MHz, 26.5 MHz, 45.5 MHz and 58.5 MHz), 0 dBm, 6% OMI. IMD2 is measured at f1 ± f2. (5) RRAF: Measured in a typical system with PBN ODN4P-RT, 10 km single mode optical fiber using 35 MHz noise loading.